The smell of sawdust gives me a buzz, not unlike, one too many beers. Cutting wood lets me relax and concentrate on the task in front of me, all other thoughts fall away like a useless scrap. And at the end of a long day spent creating things with wood there is little else as satisfying as stepping back to see what I have built with my own hands. It took me years of hacking away at lumber to find this zen state of builders satisfaction. And like the happy drunk who thinks he can jump small mountains, after building one too many chicken coops I thought I could build a house. If only it were that simple. Fortunately (or unfortunately) in Garden City, ID, you can’t just walk out back and start digging a foundation for your future home. You must ask the city for permission. So I went in search of an architect who could help me jump this hurdle. Two years later here we are finally building our home. During this process I decided building the whole house by myself wasn’t going to work. We have patched together a team of professional tradespeople that I am very happy with starting with the artist and architect Byron Folwell of Studio Malestrom. After quite a bit of house shopping, we decided we’d rather build at our existing homestead in Garden City. 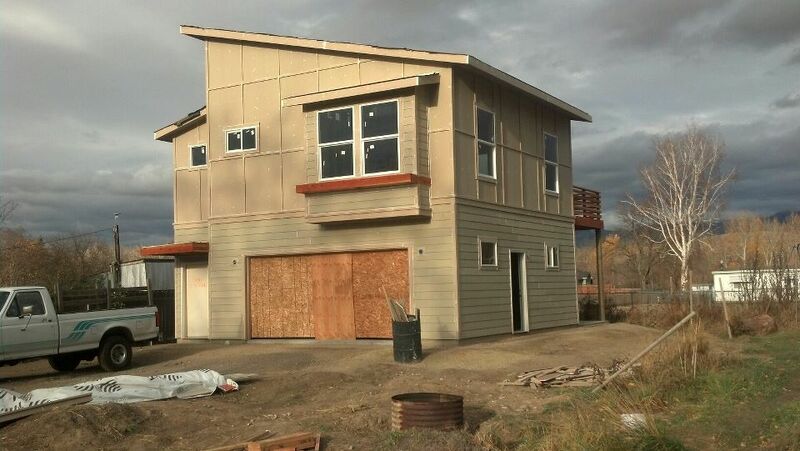 Turned out that other houses we could afford weren’t a block from the Boise River and Greenbelt, didn’t have as much land, and needed a lot of work anyway. So, about the time we found out we were expecting Rio, we decided to take the plunge. We then applied to two different banks and waited OVER A YEAR before finally securing a construction loan and breaking ground for our new home. We are doing as much of the work ourselves as we are able and as makes sense to do with our skill set and timeline. Marty and a few brave friends tore down the old trailer. He also built the foundation with some assistance from a neighbor, and we’ll do a lot of the interior finish work once the framers, plumber, and electrician have finished their jobs. If you happen to be looking for contractors, we could provide you with a list of people we like and trust. Tags: demolition, foundation, House. Bookmark the permalink. gorgeous! love the nursing shovel pic! inspirational as ever. I love seeing Marty’s writing again. Hope that you two can find time to write more once you’ve moved in.